The last step of making a quilt, after days, months, or years of working on it, is to attach a quilt label. The quilt label tells others who made the quilt, when, where and why. 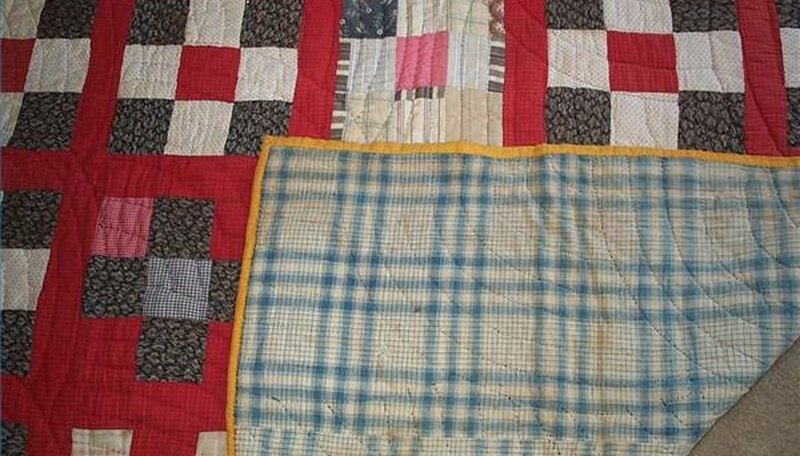 This is important information considering that well-cared for quilts can survive centuries. With antique quilts leaving mystery in their wake, here are a few ideas for quilt labels that can add to your quilt without sticking out like a sore thumb. The basic job of the quilt label is to document you and the quilt's information. Cut a piece of muslin or other light colored fabric into a 6-by-6 inch square and press under the edges by 1-inch. After you have written the information that you want to include on the quilt label, stitch the label to the backing of the quilt on three sides. Leave one side open like a pocket. Use matching thread to hide your stitches next to the fabric. Gather together sample swatches of the fabrics you used on the front of the quilt, including a sample of the binding. These portions of fabric can be as large as 5-by-5 inches, whether folded or in a single layer. Slip your fabrics under the pocket-like label and stitch the last side of the label closed with a slightly contrasting thread. These extra fabrics can be used if the quilt begins to breakdown over time and patches need to be replaced or mended. The contrasting thread will let the quilt owner know which side of the patch to open to retrieve the patches. A nice way to use up fabrics the quilt body was made from is to make extra fabric blocks with your scraps. For example, if there are pieced stars on the face of the quilt, you can put together one extra block during the piecing step of quilt making to be used for the label. Make sure the center of the star is large enough to write on and make adjustments if necessary to enlarge the block. Press under the edges by 1/4 inch and write in your information. Stitch the label onto the back of the quilt when it is complete. This type of block for block matching of the label to the front of the quilt will give a better flow to the look of the quilt as a whole. If you want to make it a little more fun to find the label, make several extra blocks and attach them all scattered along the backing. One block could contain all of the information, or bits of information could be written on each block, making all of the extra blocks work together while using up your scraps at the same time. To show off your label and let admirers know exactly where it is on the back of the quilt, consider adding appliqué or embroidery to your label around the edges. If you don't mind stitching you can also embroider the information on rather than writing it in with a fabric pen. While the embroidery should be added before the label is attached, a skilled person can appliqué flowers, vines or animals over the edges of a quilt label to highlight it; just be sure not to stitch into the front of the quilt in the process.